Outdoor barbecue islands and kitchens can range from super simple to incredibly extravagant. Some homeowners prefer the basics, but many are fond of entertaining outdoors in a fully outfitted kitchen complete with built-in appliances and seating. Here are a few helpful guidelines to get your outdoor barbecue or kitchen planning started. If you aren’t aware of how the permitting process works in your area, save yourself time and frustration by hiring a professional. You may not need a permit to install your outdoor barbecue itself, but new gas or electrical lines will require permits. The permitting process varies depending on your local city or county. Your landscape design and the style of your home should be considered. 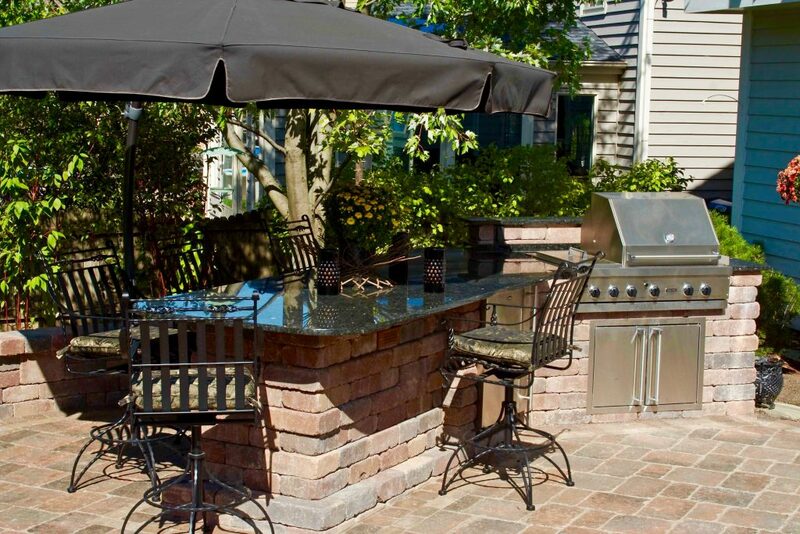 Your barbecue island should blend in with the overall style of your landscaping and architecture for a cohesive feel. The location and layout of your outdoor barbecue island or kitchen can make a big difference. Do you have an idea of the wind pattern in your yard? Being aware of this can be helpful since your grilling area can be positioned so that smoke doesn’t drift back toward your house or outdoor seating area. Also, if you entertain on a regular basis and don’t want to have to carry plates very far, ask your landscape designer if you can position outdoor barbecue near a door that leads to your indoor kitchen. Make sure your barbecue island design allows room for utensil storage and prep. Adequate storage will help keep clutter to a minimum. When thinking about how much space you might need for storage and prep, ask yourself if you plan to use the kitchen primarily during the summer months or whenever the weather is conducive. Do you plan to host dozens of guests or use the space for small family gatherings? Choose your appliances and hardscape materials wisely. Check to be sure that any appliances you choose for outdoor use are made to withstand the elements and temperature extremes. The same holds true for the hardscape materials you use. Keep in mind that materials like tile or marble are often slippery when wet and may not be resistant to grease or food stains. Creating a beautiful and functional outdoor barbecue area requires knowledge of grading requirements. This is another reason why it makes sense to hire a landscaping contractor who has extensive experience with designing outdoor barbecue islands and kitchens. 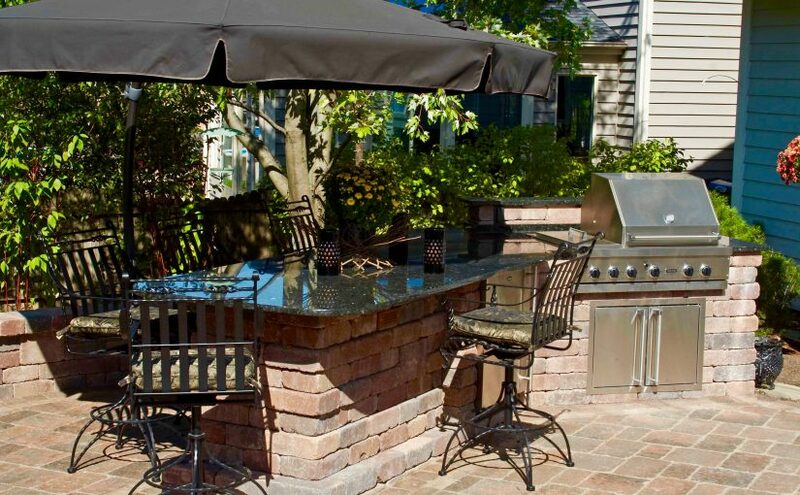 To find out how we can help you create the perfect kitchen or barbecue island for your outdoor living space, call us at 630-932-8966 or send us a message through our online contact form. DuPage County area including Naperville, Bartlett, Glen Ellyn, Wheaton, Elmhurst, Lombard, Addison, Carol Stream, Glendale Heights, and other surrounding Chicago suburbs.